Associate Professor Rod Cross experimenting with a falling slinky. If a slinky is not at the top of your Christmas list you might want to think again. Making a slinky walk down steps or draping it over your arm to imitate a robot is fun but the coiled spring toy hides a more intriguing capability. "Hold a slinky by its top and let it hang under gravity, and then release it. What happens next is not visible to your naked eye but, remarkably, the bottom section of the slinky remains suspended in midair until the entire top section collapses onto it," says Associate Professor Mike Wheatland, from the University of Sydney's School of Physics, whose interview on falling slinkies has become a Youtube hit. He and Associate Professor Rod Cross, also from the School of Physics, have co-authored a paper published in the American Journal of Physics this month, which reveals exactly what takes place when a slinky falls. "It might seem like a frivolous exercise, but in fact it provides us with an insight into the fascinating physics of everyday objects. The physics of a falling slinky also applies to a falling steel bar - with a steel bar it just happens over a much shorter time," said Associate Professsor Wheatland. "The bottom of the bar does not start to move until a fraction of a second after the top starts to move." Wildly popular after its invention in 1943 by a naval engineer, and making a comeback through the character 'Slinky Dog' in the 1995 film Toy Story, the slinky still had secrets to be uncovered. "The slinkies that star in our movies show that when dropped from a height they collapse from the top down. The bottom of the slinky remains hanging in space for an estimated 0.3 seconds," said Professor Rod Cross. 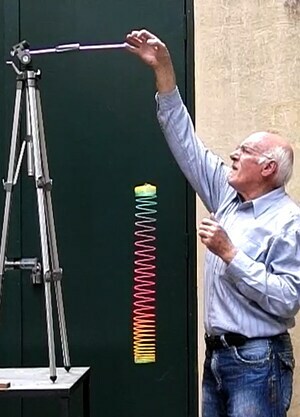 By filming real falling slinkies the researchers improved on a previous theoretical model. "We took metal and plastic slinkies and used high speed cameras to capture their falling motion at 300 frames a second," said Associate Professor Cross. Analysing the film frame by frame the researchers found that the tension in the slinky spring collapses from the top downwards, behind a wave front which runs down the coil. During the collapse the top of the slinky turns collide, one by one, as the tension is released at the wave front. "It takes a finite amount of time for the information or 'signal' about the changed conditions to be transmitted from the top to the bottom of the slinky," said Associate Professor Wheatland. "The falling slinky's behaviour might seem counterintuitive, but physics can be like that. Dynamics - the interplay of forces around us - often need to be examined to become clear."